Janie on her first birthday. I am a pediatrician working in an academic children’s hospital where I see predominantly children with special health care needs. My husband, Jim, is a colorectal surgeon. Together, we have a daughter, Janie, with short bowel syndrome who is dependent on home parenteral nutrition (HPN). We would like to share our journey as physician parents with you. Life changed dramatically for us when we became parents. Two years after our son, Ryan, was born, we had a second child, our daughter, Janie. During both pregnancies, we enjoyed imagining what our child would be like. All parents have hopes and dreams for their children. When you have a child with special needs, those hopes and dreams change. We used to wonder: Would Janie be smart or funny? Would she be good at sports? Will she get along with her big brother? As she got sicker and sicker, the questions we asked about Janie changed. We wondered: How big will her scar be? Does she really need a stomah? Will she ever be able to eat? Will she live? Does she know how much we love her? Janie was born premature at thirty-four weeks gestation, shortly after being diagnosed as small with no amniotic fluid. She weighed just three pounds at birth. Initially, besides being small, she appeared normal. Within a day, however, she was diagnosed with a distal ileal atresia. Janie underwent her first of six surgeries at four days of life. We were relieved that they were able to resect the area and reconnect the bowel, “solving” her problem with the initial surgery. She remained in the neonatal intensive care unit (NICU) for two months as a “feeder and grower,” off and on PN. When we were discharged, she was quite jaundiced and we were scheduled to come back daily for studies and weight checks. Despite this, we were thrilled to have her home with us, and to finally have her big brother meet her. 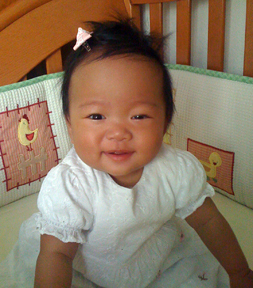 Ryan was less than two years old at the time and had not been allowed in the NICU to visit her. Over the next two months, we were in and out of the hospital for failure to thrive and malabsorption. Sometimes, we would be home for less than a day, sometimes we would make it for a week. Finally, when Janie was almost four months old and still weighing about six pounds, the decision was made to take her back to the operating room (OR) for a resection of her initial anastomotic site, which was thought to be the cause of her difficulties. We hoped this would solve her problems and would allow us to go back to a normal life. We anticipated a simple resection and re-anastomosis like her original surgery, but instead she came back from this surgery with a central venous catheter, a G-tube, and an ileostomy. Unfortunately, things became more complicated when, within a day, she was taken back to the OR. They found the majority of her bowel was necrotic, requiring a massive resection and jejunostomy. We thought Janie would die that night. She was made DNR (“do not resuscitate”) and after her return to the NICU, we were left to spend time with her behind drawn curtains. Janie managed to pull through, but in addition to severe liver disease, jaundice, and failure to thrive, she now had short bowel syndrome and would be PN-dependent for the remainder of her predicted short life. Our medical team gave us two options: to consider a multivisceral transplant or take her home knowing she would probably not make it to her first birthday. For us as parents, we had decided transplant was not the route we wanted to take. This is when we began looking into Omegaven®. We had heard about it in passing from one of the neonatologists, but it was not available in our city at the time. When we realized it had originally been used at Boston Children’s Hospital, I thought perhaps I would know the investigators as I had completed my pediatric residency there. As luck would have it, the primary investigator was a pediatric surgeon, Dr. Mark Puder, who had been Jim’s senior resident when Jim was an intern. We contacted Dr. Puder ourselves, looked into the published research, and spoke with medical colleagues at other institutions with clinical experience in Omegaven. Some of our own doctors discouraged us and told us we were searching for miracles. We were. We took a chance and had Janie transferred to Boston Children’s Hospital, a difficult decision that involved moving our family across the country. At fifteen months of age, we returned to Boston to have Janie’s intestines reconnected. When we returned home, we were finally able to cycle her HPN to run over twelve hours instead of twenty-four. This came just in time, as chasing after a newly walking toddler connected to a backpack on your back all day has its challenges! Luckily, once Janie got going, she didn’t mind balancing and wearing her own backpack. With this time came a lot of hope for us that things were on the upswing, that we had gone through the worst of it, and that she would continue to get better. Over the next year, there were a lot of bumps. She still wasn’t able to tolerate enteral feeds. We thought she would need another surgery to “fix” a persistently dilated loop of bowel that was believed to be the problem, but ultimately the surgery was canceled. She was changed over to a GJ-tube and tried on another prokinetic medication. We made little progress in advancing her enteral feeds and she was still on full HPN. Though it was a difficult year, we also saw Janie grow and develop. While we continue to hope that someday she may come off HPN, we don’t wait for this day. We look at the big picture and marvel at all the wonderful things that are happening in the midst of our struggles. When Janie was two and a half years old and our son had his fourth birthday, his birthday wish was for Janie to start talking so they could talk together. Over the past year and a half, she not only began talking, but now talks nonstop with never-ending energy! Ryan may at times regret that birthday wish, but he will never tire of having a sister in his life. At the end of the day, we have a happy four-year-old daughter. And we have been able to answer many of the questions we used to have about Janie before she was even born. Would Janie be smart or funny? Well, Janie is smart (gifted, actually! ), and she is funny. She makes us laugh every day. Will she be good at sports? Not really. Will she get along with her big brother? Usually, and when they do it is a beautiful thing. How big will her scar be? Her scars are big, but that just means she is growing. Will she ever be able to eat? She is eating better and is growing and thriving. Will she live? Life is precious; we take every day as it comes. Does she know how much we love her? Of course she does, because we tell her every single day. 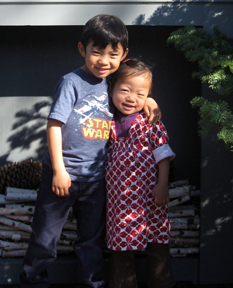 Janie and Ryan now have a little brother whom they adore, and Janie is enjoying her new role as a big sister. Editor’s note: It is important to realize that Omegaven lipid has not been approved by the Food and Drug Administration (FDA) for release in the United States. Dr. Darlene Kelly, Oley’s Science & Medicine Advisor, adds that there are multiple lipids used in Europe and Asia, but at this point only Intralipid®, a product made of soybean oil, egg phospholipid and glycerin, has been approved by the FDA. There are current efforts to have alternate lipids reviewed by FDA. Data and clinical experience, primarily from Europe, are promising. There have also been several research studies in the U.S. that have focused specifically on Omegaven (see News on Omegaven). Omegaven is an omega-3 based lipid solution made from fish oil. Progress is being made in identifying dose requirements, primarily for babies. It must be emphasized that use of this lipid in older children and adults with PN-related liver disease has not been fully explored. The mechanism for development of PN-related liver disease is uncertain; it appears that the type of lipid used, the amount of lipid used, or the frequency of lipid infusion may be related to the pathophysiology of liver disease. Whether the improvement that has been seen in babies and very young children on Omegaven is related to the ability to decrease the Intralipid infusion or to a specific characteristic of the fish oil, Omegaven does seem to play a role in some specific consumers. HPN consumers need to be following the lipid story as it develops over time. We at Oley are very pleased that this beautiful family (and especially Janie) is doing so well after a difficult course. We were privileged to meet them at the Oley meeting in California this summer, and are happy to say Dr. Huang and Dr. Yoo’s presentation is available on the conference DVD.